by Joshua Hammer for Outside Magazine. 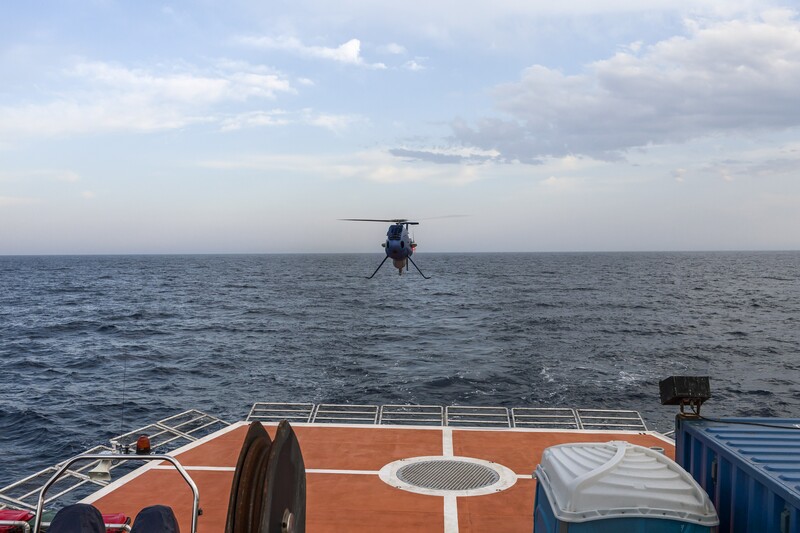 Three days after boarding the 131-foot rescue vessel MV Phoenix in Augusta, Sicily, I was standing on the ship’s top deck on a warm June dawn, watching the rotor blades of a blue-and white-striped Camcopter S-100 drone shudder into motion. 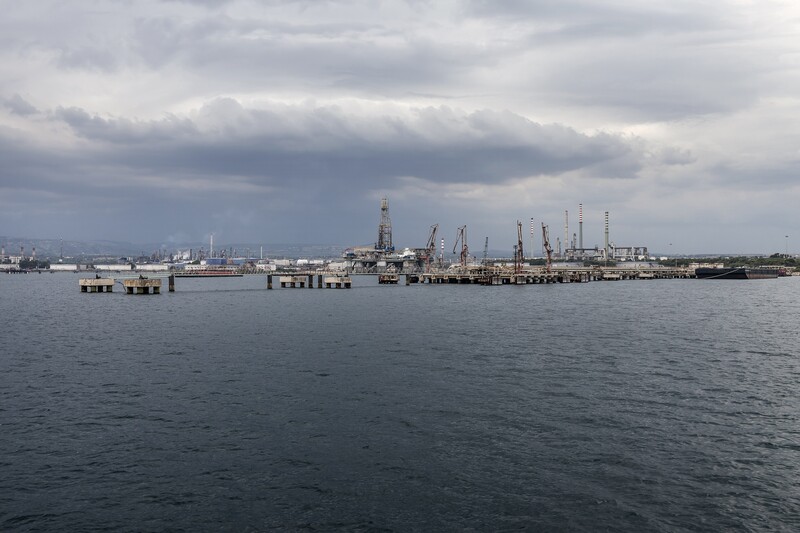 We were a few miles southeast of the Bouri Offshore Field, a patch of deep-water oil wells and drilling platforms jointly owned by an Italian oil company and the Libyan government, in the heart of the Mediterranean Sea. Lit at night by natural gas flares and heavily trafficked by naval ships, merchant vessels, and maintenance boats, the oil field has become a beacon for refugees fleeing by sea from war and poverty in sub-Saharan Africa and Syria. 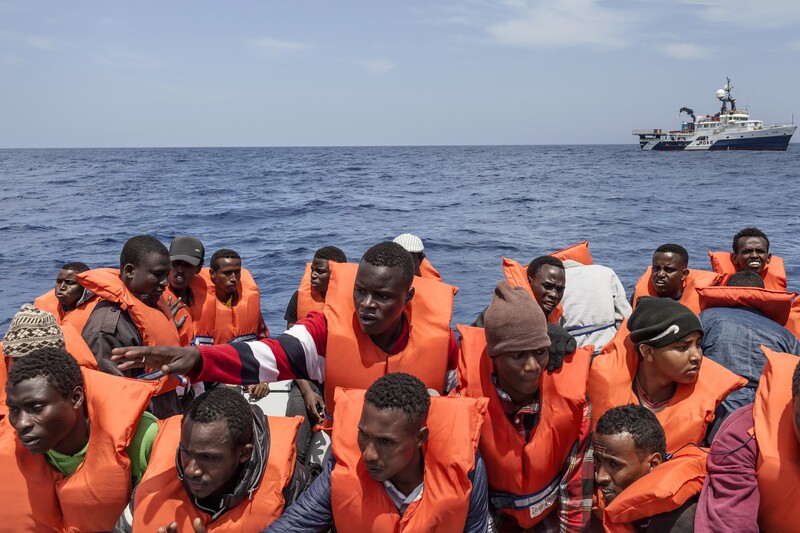 Last year, 219,000 of them crossed the Mediterranean in rickety fishing boats and open dinghies, a massive flotilla organized by smugglers along the coast of lawless Libya. In their desperate attempt to reach European shores, refugees have drowned by the thousands. The Phoenix had arrived in the vicinity of Bouri the previous night, after a 30-hoursail from the east coast of Sicily. Now we had entered a patrolling pattern. 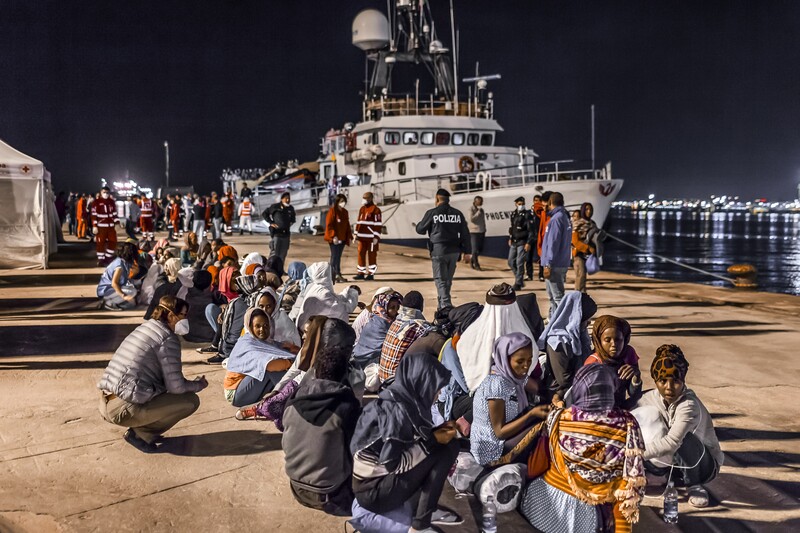 We were waiting either for a summons to action from the Maritime Rescue Coordination Centerin Rome, run by the Italian Coast Guard, or for visual contact with a refugee-filled boat by one of the Phoenix’s drones. 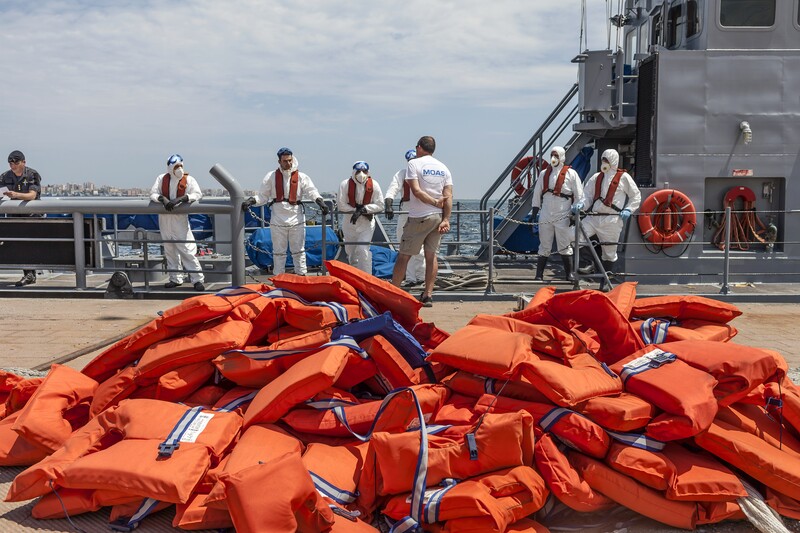 Because those vessels are often unseaworthy, and the physical conditions aboard are so wretched, the MRCC encourages ships equipped for rescues to intercept the migrants as soon as they exit Libyan waters and transport them to southern Italy. 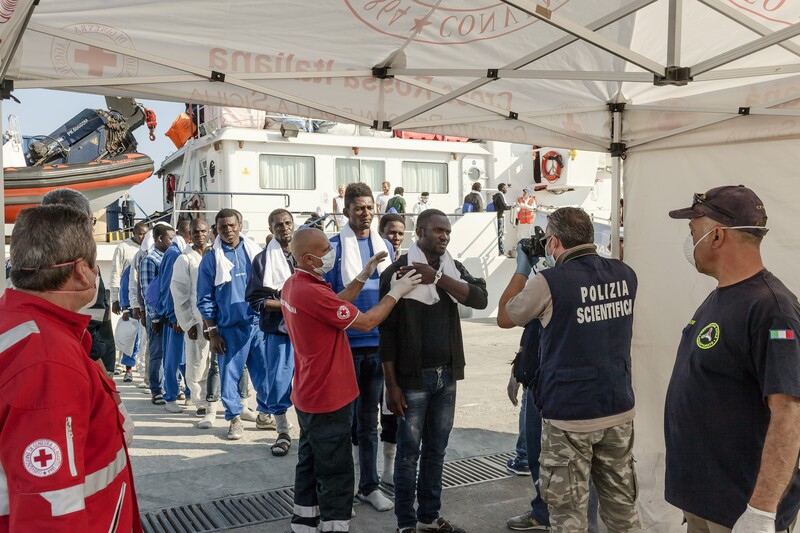 Once in Italy, they are obligated to remain inside detention centers while their applications for political asylum wind through the country’s bureaucracy. “We consider a boat that is overcrowded to be in imminent danger,” the founder of this private rescue venture, a 34-year-oldAmerican entrepreneur named Christopher Catrambone, had told me earlier. “When you have a boat that is equipped for ten fisherman,” he said, “and you have 400 people onboard, including women and children, without life jackets, this boat needs to be rescued. “Born and raised in Lake Charles, Louisiana, the son of an oil and gas engineer, Catrambone was a self-made millionaire by age 26. His insurance company provides kidnapping, terrorism, and combat-related death and in-jury coverage to journalists and military contractors. Based on Malta, the only English speaking country in the Mediterranean, it had $10 million in revenues last year. 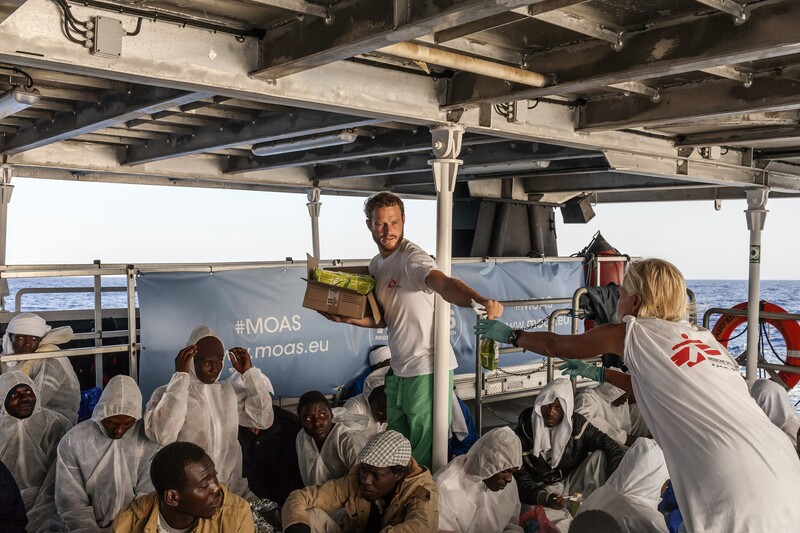 In 2013, Catrambone poured $8 million of his personal fortune into creating the Migrant Offshore Aid Station (MOAS), the Malta-based NGO that deploys the Phoenix. He then spent two months last summer and fall aboard the ship. 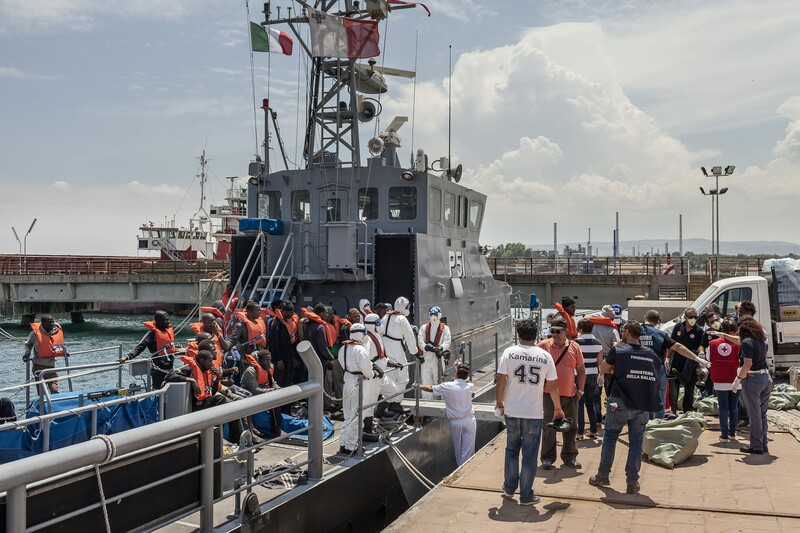 During that time, the Phoenix participated in nine rescue operations and came to the aid of 3,000 migrants, either carrying them to Italian ports or transferring them onto naval vessels. Then this spring, in its first 60 days of the season, the Phoenix helped rescue 5,597more people in 17 separate operations. Catrambone, however, remained on Malta this year to run his insurance business, leaving shipboard operations in the hands of his wife and partner in the venture, 39-year-old Regina Egla Catrambone, a tirelessly energetic, take-charge Italian who has thrown herself into the rescue effort. On this journey in early June, there were 23 of us aboard the refitted trawler, including a Spanish captain, Gonzalo Calderon, his six-person crew, and a three-man search and rescue team made up of former members of the Armed Forces of Malta. There were also six doctors, nurses, and logisticians from Doctors Without Borders, as well as two pilots and an engineer from the Austrian defense contractor Schiebel to operate the Phoenix’s two drones. The S-100’s blades scythed the air as it rose and hovered above the landing pad. Banking left, it hurtled at 150 miles per hour toward the Libyan coast. In a cramped control room, the two young drone pilots and the engineer clustered around a monitor, receiving high definition images from a sensor attached to the aircraft’s skid. Around midmorning, the usual routine aboard the Phoenix—a game of Texas Hold ’Em on the lounge conference table and chef Simon Templer, an old friend of Catrambone’s from New Orleans, puttering around the galley preparing lunch—stopped suddenly as word spread through the ship: possible rescue. The drone had spotted a boat about 30 miles off the Libyan coast. The only question, Regina explained as the captain opened the throttle and sped south, was whether the MRCC would order an Italian naval vessel to handle the pickup or whether the Phoenix would be given the job. “Last time,” said John Hamilton, a rangy, sunburned member of the Maltese rescue team, “the migrants had no food or water for12 hours.” Simon Bryant, an Alberta physician on a six-month Doctors Without Borders contract, turned to David Johnston, a grizzled logistician from New Zealand. “Time to get changed,” he said, and the two men disappeared into the infirmary. IN LATE MARCH, as the Catrambones were preparing for the six-month rescue season, I made my first trip to Malta, the densely packed island nation of 400,000 where they live. A bastion of Christianity during the Crusades and a vital Allied supply station in World War II, the former British colony has been reborn as a global financial center and a popular location for Hollywood filmmakers, who like its generous tax breaks and generically Middle Eastern look. It’s also smack in the middle of the European debate over migrants. As I taxied down to Marsa, the grimy commercial port, I passed a barracks surrounded by barbed wire and filled with sub-Saharan refugees. Malta’s government says it is sympathetic to the migrants’ plight, but after accepting about 19,000 in the past decade, it insists it has room for no more. I found Catrambone on the aft deck of the Phoenix, surrounded by the sounds of drilling, hammering, and scraping. The hull was getting a new paint job, and the crew was using a needle gun to blast off the rust. “As soon as the boat came back in October, we started doing work. It’s a big steel boat, and every single structure needs to be in perfect shape for the season,” said Catrambone, a shambling man with tousled black hair, a Lincol nesque black beard, and a trace of Louisiana drawl. Recently, after the venture began attracting media attention he hired an advisor—Robert Young Pelton, the veteran war journalist and author of The World’s Most Dangerous Places—to handle requests from organizations including NPR and Al Jazeera. He led me up a staircase to the upper aft deck and pointed out two RHIBs mounted snugly on metal cradles. “Feel this! “he urged, running his hand along one of the double-hulled, 12-foot dinghies, each equipped with two 75-horsepower outboard engines. “It’s got foam filling, so even if you puncture it, it will still float.” His team had just repositioned the cradles to a lower position and installed two large pipes to guide the craft gently into the water. “Before, we were using a crane,” he said. “In Force 4 winds, it was highly dangerous. “The last time Catrambone threw himself into the business of boat renovation, the circumstances were rather different. In 2005, he was working as a freelance insurance-claims investigator after earning a degree in criminology at MacNeese University in Lafayette, Louisiana. “He had this Volkswagen Passat with tinted windows, and a video camera, and we’d go places and he’d videotape people through his window,” recalls Templer, who lived in the same apartment building in New Orleans. Catrambone was “kind of neurotic,”Templer remembers. “He was like Kramer from Seinfeld—this awkward, geeky type, but cool and laid-back at the same time. ”That September, Catrambone was on a job in the Bahamas when Hurricane Katrina struck New Orleans. Homeless, he setup shop in a three-cabin boat in a marina on Saint Thomas, in the U.S. Virgin Islands, and invited Templer and another dislocated friend to join him. With $20,000 in pooled compensation from FEMA, the trio leased a decrepit double-decker paddle-wheel boat and turned it into Cajun Mary’s Riverboat Lounge, a floating bar and restaurant. “It was, in our way, our mourning for and tribute to a city we loved so much,” said Catrambone. A couple of months later, Catrambone got a call from G4S, a huge private security firm based in the U.S. It offered him a different sort of insurance-related assignment: locate medical treatment in Dubai for a U.S. contractor who had suffered a herniated disk there. That job led him within the year to Baghdad, where insurance providers for big security companies were struggling to provide decent hospital care for contractors injured by roadside bombs. Catrambone assembled a network of secure hospitals in Iraqi Kurdistan, then did the same in Afghanistan. Soon he started his own war-zone insurance company, and the Tangiers Group, named for his favorite North African city, took off. By the time he was 26, he was a multimillionaire. AT THE END OF 2013, Catrambone left Tangiers in the hands of his subordinates and began combing through online catalogs searching for a ship broker. “Christopher is like a hurricane,” says Regina. “Standing in the eye, it’s very calm for you, but for the people around you, he can be a disaster. He’s blowing around, people think he doesn’t have a plan, but he’s very disciplined when he needs to do something. ”He ultimately tracked down the Phoenix in Norfolk, Virginia. It was love at first sight. Built in 1973 and originally used as a fishing trawler, then later as a scientific-research vessel, the ship had a steel hull, a deep draft, and a propulsion system built by Warsilla, a Finnish company that specializes in icebreakers .“She was a badass little boat,” Catrambone says. He bought it on the spot for$1.6 million, spent $3.3 million more on a refit, and sailed it back across the Atlantic himself, with Cauchi at the helm and Templer in the galley. At one point the Phoenix struck something, possibly a container. “We heard a noise like boom-boom-boom, and then it stopped,” Cauchi recalled. He feared that the boat’s new $1 million propeller had been destroyed. In fact the collision did break off a chunk, but Catrambone wasn’t fazed. “He was a mad dog,” said Templer. “He was like,‘ Let’s go! Let’s go!’ ”When the Phoenix launched in August2014, European diplomats and journalists were dubious. “They did not give us a lot of respect,” Catrambone said. “They suspected we were rogue Greenpeace-type activists causing trouble.”Catrambone’s doubts grew as well. 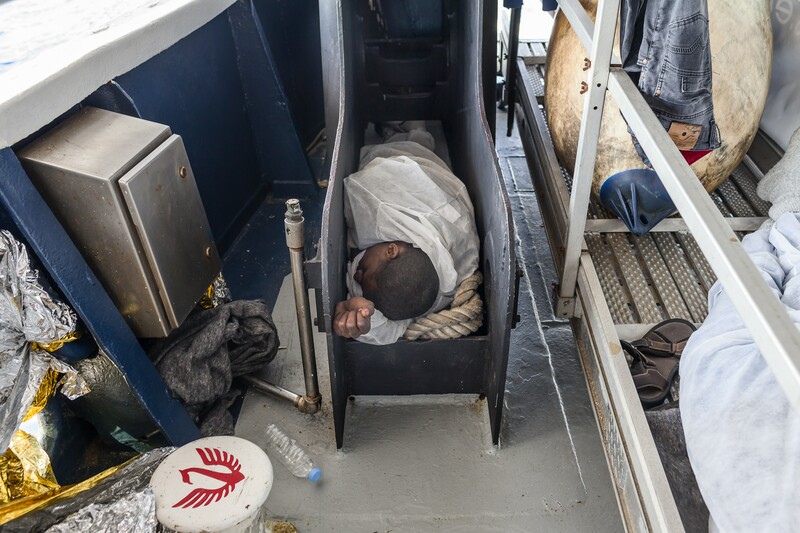 “After six days at sea, we were frustrated,” he told me. 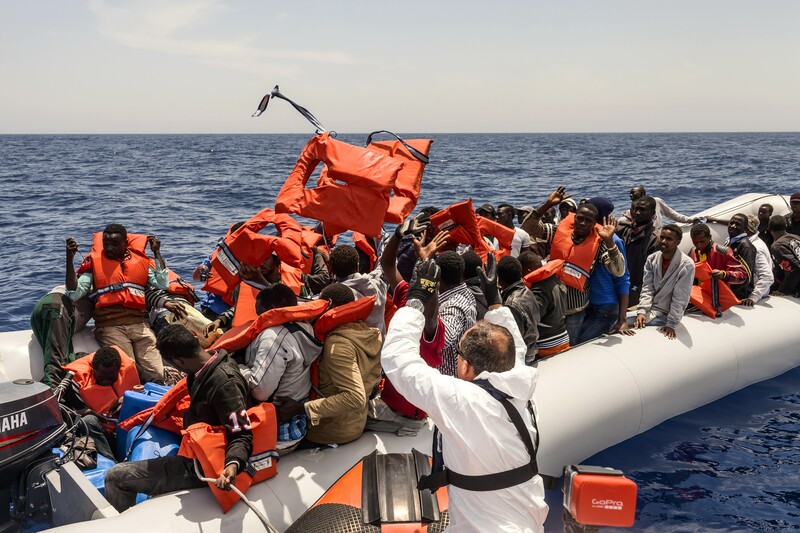 “I was saying, ‘This is all a lie, the migrants are not even coming.’ ” Then, on day seven, the Phoenix carried out a double rescue of a fishing boat packed with about 300Syrians and then an inflatable dinghy filled with sub-Saharan Africans. The MRCCtook note, and gave the Phoenix temporary command of three other vessels. MOAS had proved itself legit. By the time the mission ended in October, Catrambone said, “wedidn’t want to leave.” They stopped only because the boat was in dire need of repairs—and because the effort was draining the Catrambones’ finances. Indeed, last March, Catrambone doubted whether he’d be able to deploy the drones in2015. He’d spent the winter of 2014 extending the aft deck with a launch pad for two new Camcopter S-100’s, pilotless mini choppers that are capable of flying 500 miles without refueling and are used by navies around the world. The only problem was the price: about $5.5 million for two of the drones and a team to operate them. So Catrambone convinced Hans Georg Schiebel, owner of the Austrian military contractor Schiebel, to lease them to him for six months for $1.8 million. “I told Hans, ‘Show the world that this drone can be used for peaceful purposes,’” he recalled. “Hans said, ‘Deal.’ ”But after burning through much of his fortune, Catrambone was beating the bushes for donations. 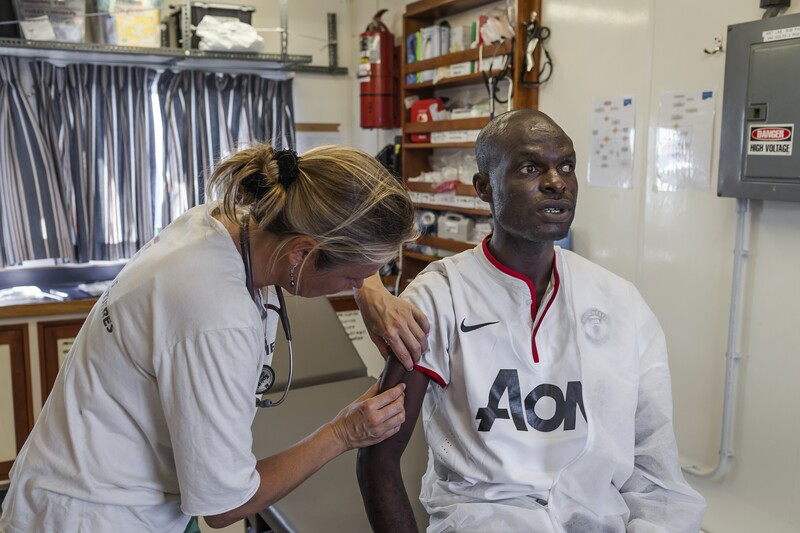 Doctors Without Borders had given $1.6 million and a medical team; Germany’s Oil and Gas Invest was paying for the boat’s fuel. But he was short the $1.8million for the drones. “We’re going to have to crowdfund for it,” he said. “Organizations like MSF are just not into paying for drones. ”A few weeks later came good news:AVAAZ, a global activist organization, kicked in $500,000 for the two S-100’s. Catrambone would raise the rest just in time for rescue season. NOW THOSE S-100’s were proving to be critical assets. Hours after the drone launched from the Phoenix’s helipad near the Bouri Offshore Field, Regina and I stood on deck, scanning the southern horizon. The Nafus Mountains rose up sharply before us, about 30 miles away, wrapped in a dun brown desert haze. Regina guessed that the swells hitting the beaches of Zuwara would be about18 inches high—perfect conditions for smugglers to launch their vessels. Approaching slowly across the water, a distant white speck came into our line of vision. Slowly the dot took shape: a white inflatable dinghy, about 20 feet long, with a single outboard motor, packed with what looked like about 100 people. The ship buzzed with anticipation. On the aft deck, Bryant, the doctor from Alberta, zipped up his white protective suit and slipped on surgical gloves and rubber boots. The rest of the medical team, similarly attired, brought up 100 small blue bags from the hold, each containing socks, a towel, white coveralls, two bottles of water, and a package of protein bars. Cauchi, Ruggier, and three crewmen lowered an RHIB into the water and sped toward the tiny craft. From several hundred yards away, I watched the rescue unfold: The RHIB approached the dinghy slowly, careful to avoid exciting those inside and causing the fragile craft to tip over. Cauchi, speaking English through a microphone, reassured the migrants, all of them, it seemed from my vantage point, sub-Saharan. The team passed out orange life jackets, loaded small groups onto the RHIB, and ferried them to the Phoenix. One by one, the migrants bridged the narrow gap between the boats and unsteadily boarded the bigger ship. Four young Somali women in head scarves, the first to set foot on the Phoenix, collapsed on the deck and clasped their hands in prayer. 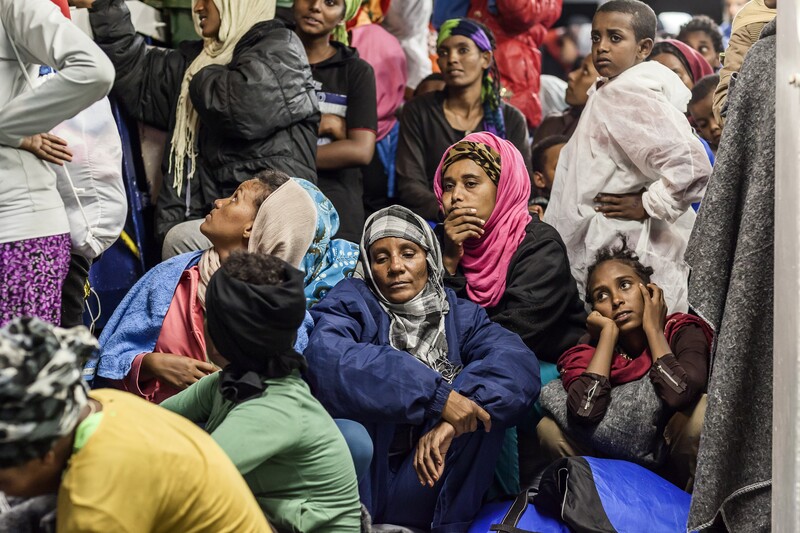 Soon the deck was filled with refugees from Somalia, Nigeria, Eritrea, Mali, and other blighted corners of the continent, 66 men and ten women—weary, grateful-looking people whose ordeals over recent weeks and months could scarcely be imagined. With a black MOAS baseball cap pulled low over her brow, Regina moved confidently among the refugees, bending down to reassure a worried-looking 15-year-old Ethiopian boy traveling by himself, searching fora Nigerian who had been punched in the eye during the dinghy voyage. The Phoenix was waiting for communications from the MRCC, which would either order it to take the migrants to a port in Sicily or tell it to remain in the area on patrol. “We have such a small group, we would rather continue, ”Regina told me. “But we are in their hands. ”It’s this work with the refugees that has been most fulfilling for Regina. In 2014, she shopped the markets of Malta for sacks of rice and vegetables and, working as Templer’s assistant, cooked hot meals in the ship’s cramped galley for hundreds of hungry people. “We were using the cover of an oil container like a tray, and I was going up and down with the tray covered with rice and tomatoes, “she said. This year she’s spent dozens of hours in the onboard clinic. “I remember this Somali lady, she was with her two-and a-half-year-old son,” she told me. 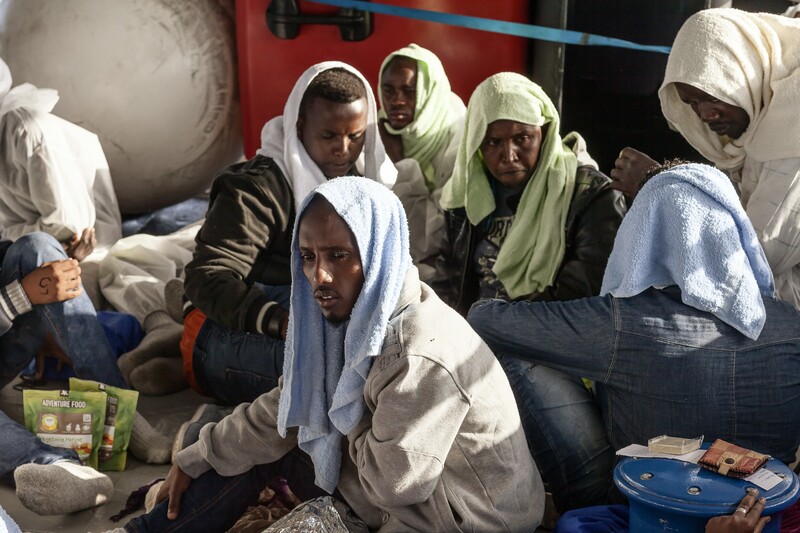 “They had been 36 hours in an open boat. We took him from the dinghy, and he was not responsive. ”Regina carried the boy to bed and helped the doctor administer an IV. Soon he was smiling, active, and playing with a Scooby-Doo doll and a toy Ferrari. As the crew awaited its orders, I fell into conversation with Abdisamat Mohammed Mahmoud, a 25-year-old Somali with a long, angular face who was leaning against the rail, staring into the sea. Born and raised in Mogadishu—“I knew nothing but war there,” he said—he had fled Somalia as a teenager and lived for six years in refugee camps in northern Kenya, where he taught himself English and Arabic. He and his wife had left to find work in South Sudan and, in April 2015, when the new country became too unstable, moved on to Khartoum, the Sudanese capital, with a plan to cross the sea to Europe. Smugglers packed them on a truck for the grueling weeklong journey through the desert to Libya. When they reached Tripoli, he was separated from his wife and held in a basement cell for 51days while he waited for his family in Nairobi to wire $500 for the crossing. “They came in two nights ago and they said, ‘Let’s go,’ ” he told me. “They said, ‘You will go to Italy on a very nice boat. No problems. ‘And they told us it would take about ten hours, but I knew they were lying.” The truck pulled up to the beach and the migrants were ordered out, at gunpoint. “Most of the Somalis had never seen the water until that night. The women were crying,” he said. “When I saw the boat, I was shocked .I thought, ‘They have cheated us.’ ” Unlike the big fishing vessels, which usually have experienced captains, migrants aboard dinghies are generally told to aim for the Bouri Offshore Field and left to their own devices. The migrants, Mahmoud said, had pushed out to sea at around five o’clock that morning. They carried a compass, which turnedout to be broken, and had a half-liter bottle of water each. People cried, moaned, and prayed. “Some really thought that this was the last day in the world. 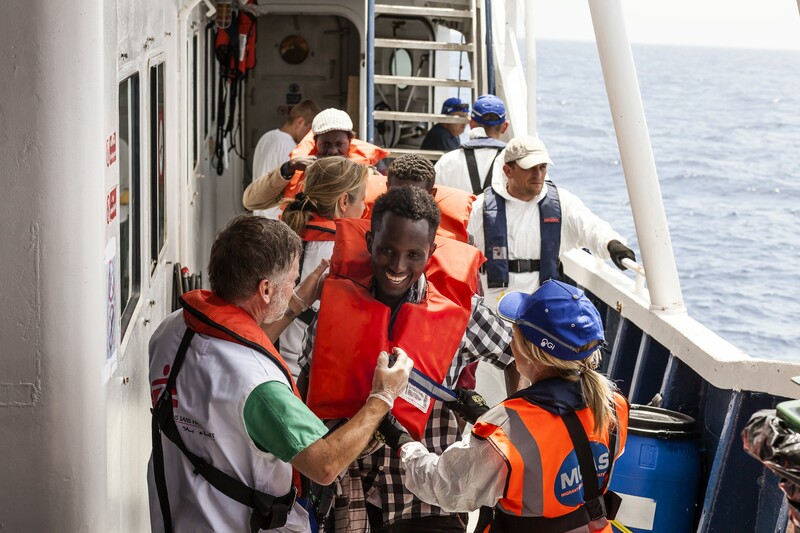 I was telling them that we will be rescued, and that we will eat our breakfast in Italy,” he said. They’d been afloat for about eight hours when Malshak Adano, a 32-year-old Christian fleeing the violence in northeast Nigeria, saw the Phoenix in the distance and began shouting and waving. Then, as Adano himself told me, “a man with a megaphone said, ‘Don’t be afraid, we’re giving you lifejackets, we’re going to protect you.’ I thought, God has answered my prayer. ”The next morning we passed Malta. The MRCC had dispatched orders to sail for Pozzalo, on Sicily’s southern coast, and off-load our 76 passengers. 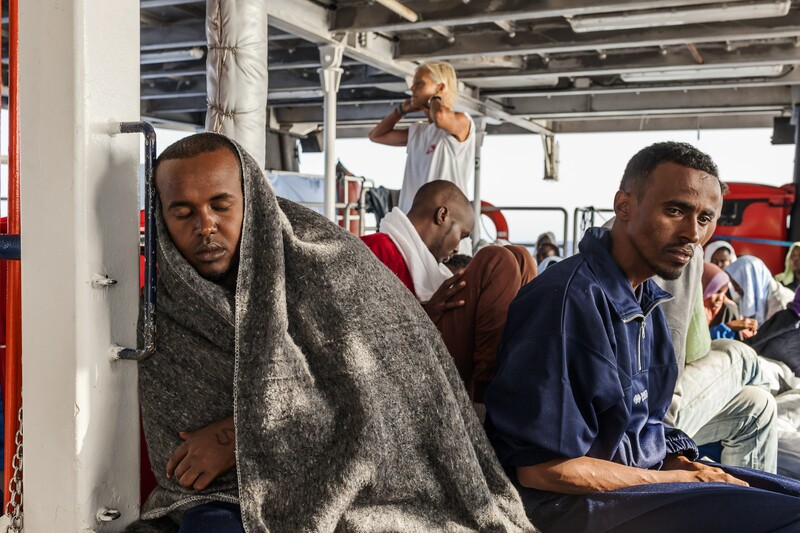 A dozen Somalis crowded the starboard rail, silently absorbing their first view of Europe. Soon Mahmoud began peppering me with questions. Was Sicily an island? How far was it from the mainland? How long would it take to reach Rome? His first mission, he told me, was to find his wife. Once reunited they would make their way to Finland, which has a large Somali community, crossing the European Union’s generally porous borders. “I’ve heard that they have jobs there,” Mahmoud said. In fact, while Scandinavian countries have strong economies and have been generally more receptive than other nations to migrants seeking political asylum, a backlashis growing: in May, a Helsinki city councilor called for the “forced sterilization” of African males, and the same month a prominent Finnish newspaper columnist referred to African migrants as cockroaches. We arrived in Pozzalo late in the afternoon. Mahmoud peered uneasily over the gangplank at the handful of Italian police men milling around the port. Then, resigned to the uncertainty that awaited him, sure at any rate that the worst was behind him, he walked down the plank and was ushered to a medical screening tent. “We’re grateful to all of you!” Mahmoud shouted as he left the boat. 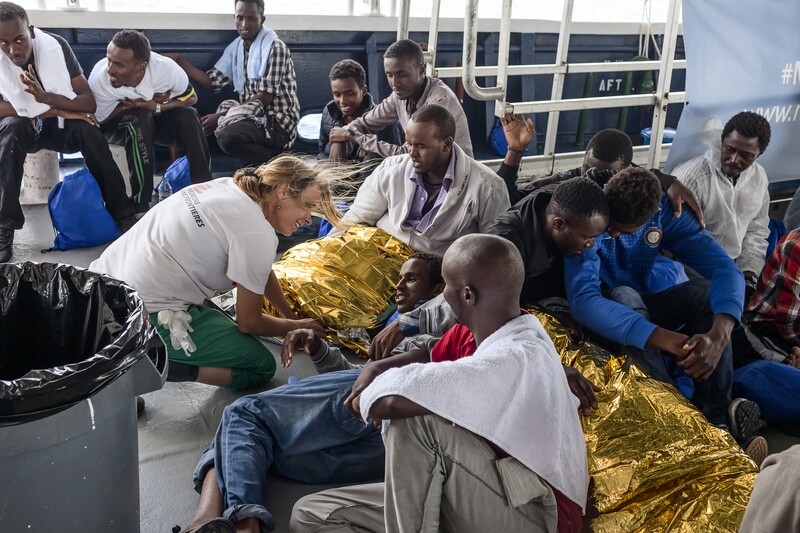 What happened to the migrants next would depend largely on their resourcefulness, Gabriele Casini, a communications officer for Doctors Without Borders, told me as we stood on deck, watching. The Italian government is obliged by EU rules to keep them in the country until their applications for asylum are approved or rejected. “But they are not strict,” Casini said. “They don’t always take fingerprints, so the migrants hope to slip through and reach Germany or the Scandinavian countries.” The two of us watched Mahmoud board a bus to a reception camp and gave him a final wave. “In these centers they are free,” Casini told me. “They can take off. ”Perhaps Mahmoud would get to Finland after all. 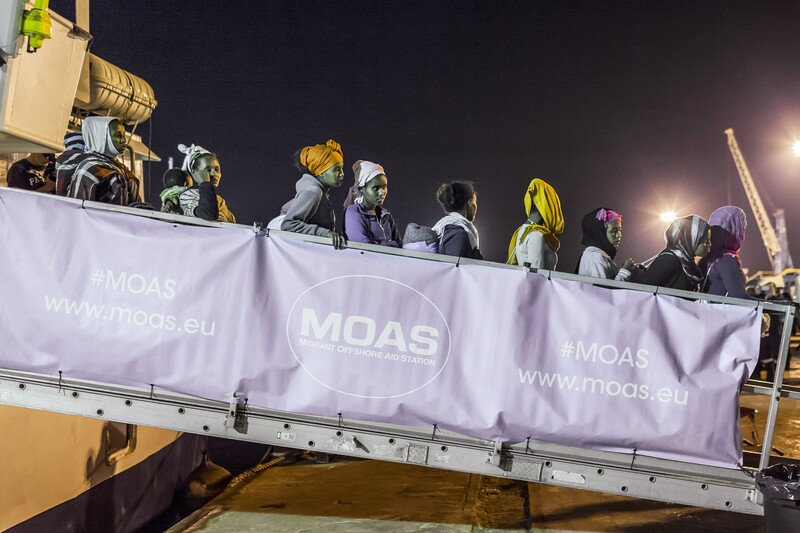 The MOAS (Migrant Offshore Aid Station) is a registered Foundation based in Malta. 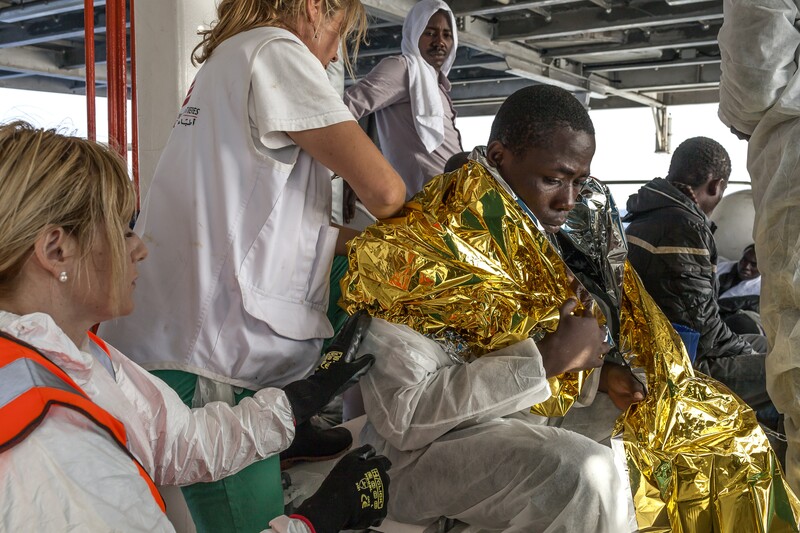 It is dedicated to preventing loss of life at sea by providing assistance to migrants who find themselves in distress while crossing the Mediterranean Sea in unsafe vessels. 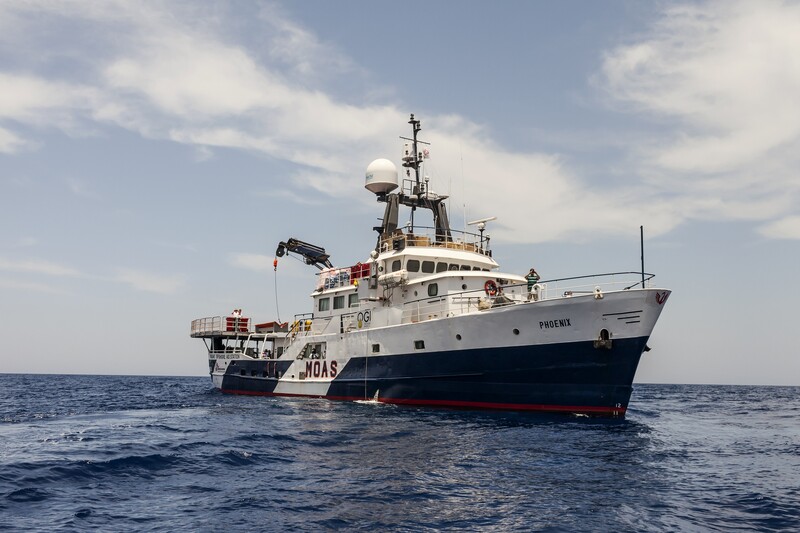 Equipped with the 40 meters (130 ft) expedition vessel, the Phoenix, two Remote Piloted Aircraft, two RHIBs (rigid-hulled inflatable boats), and a highly experienced team of rescuers and paramedics from MSF (Medecins Sans Frontieres) , MOAS is able to locate, monitor, assist and rescue vessels in distress. 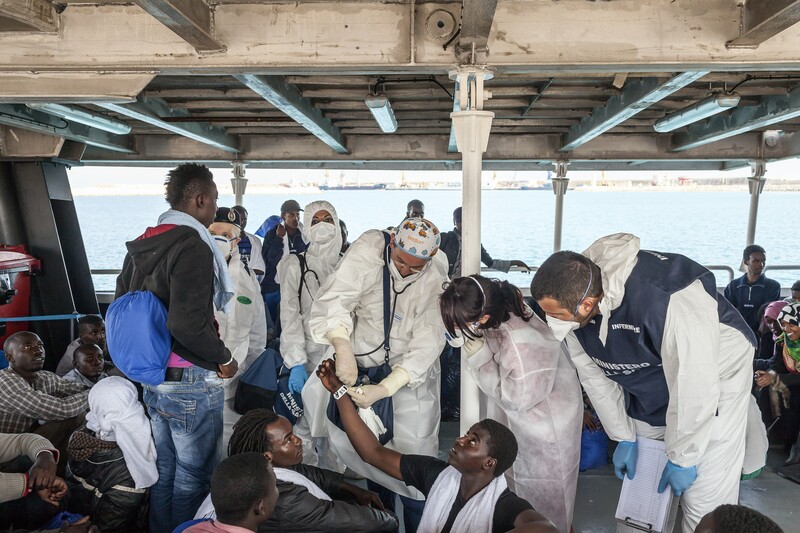 Once the migrants are rescued, the MOAS deliver them in the ports of Sicily in Southern Italy where they hand them over to the Italian authorities, which they will assist, register and host them in temporary centers for migrants in the port where they have been disembark. The project is financed by Christopher and Regina Catrambone a couple of millionaire humanitarian entrepreneur whom believe strongly in mitigating the migrant disasters in the Mediterranean. 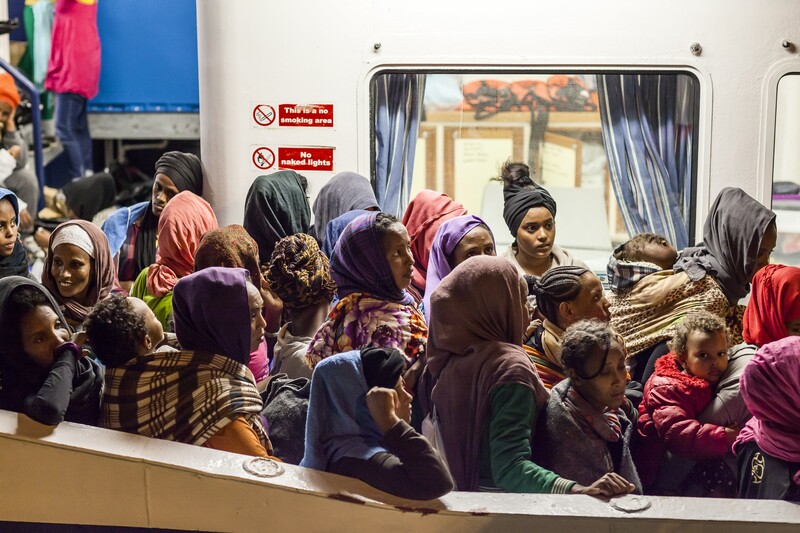 Migrants coming from different countries are seen onboard of the MOAS, after they have been rescued in the Mediterranean Sea, prior their disembark in the port of Augusta in Sicily. 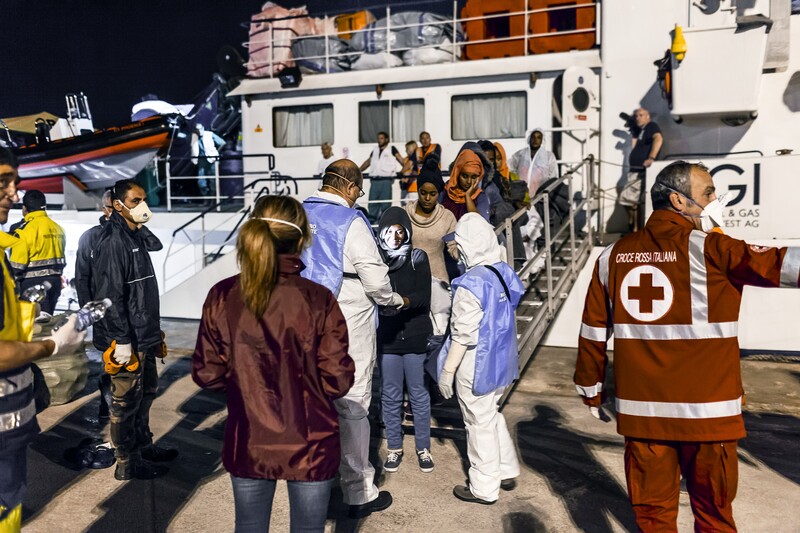 Migrants coming from different countries are seen as they disembark the MOAS in the port of Augusta in Sicily and they receive the first check from the doctors of the Italian Ministry of Health after they have been rescued in the Mediterranean Sea. 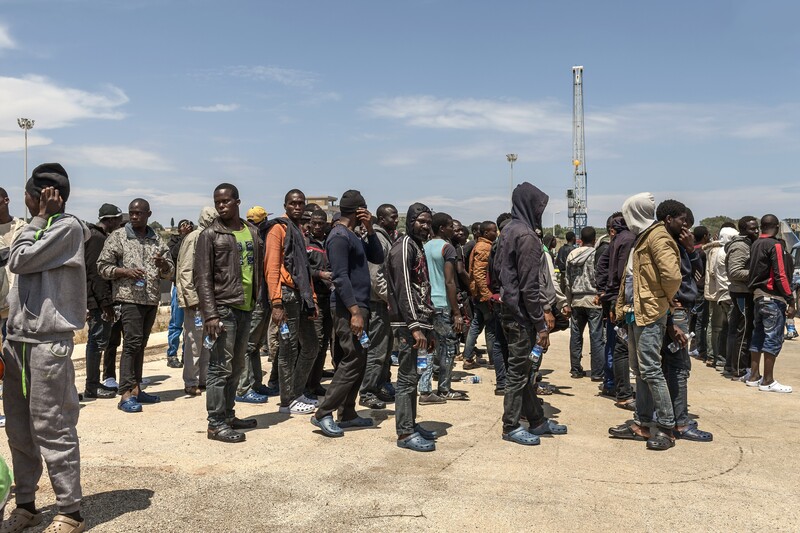 Migrants coming from different countries are seen on the quay after they have been rescued in the Mediterranean Sea by the MOAS and then disembark in the port of Augusta in Sicily. 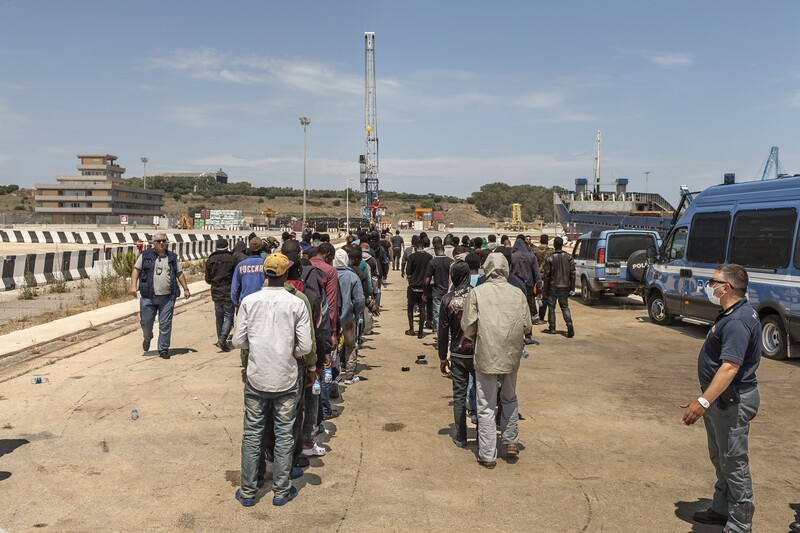 Migrants coming from different countries are seen escorted by Italian Police to the temporary center for migrants after they have disembarked the MOAS in the port of Augusta in Sicily after they have been rescued in the Mediterranean Sea. 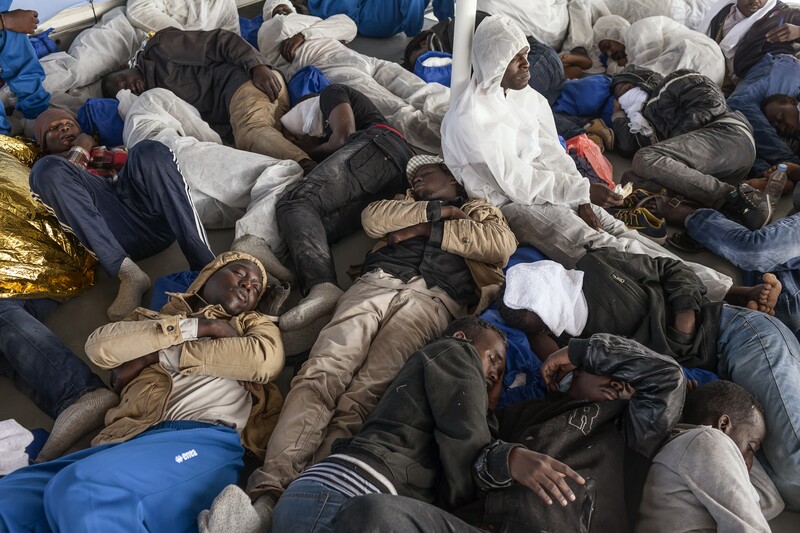 Migrants coming from different countries are seen as they disembark in the port of Augusta in Sicily from a vessel of the Maltese Coast Guard, which is anchor near the MOAS in the same harbor, and handed over to the Italian authorities after they have been rescued in the Mediterranean Sea. Life savings jackets are seen left on the quay by migrants coming from different countries after they disembark in the port of Augusta in Sicily a vessel of the Maltese Coast Guard, which is anchor near the MOAS in the same harbor, and handed over to the Italian authorities after they have been rescued in the Mediterranean Sea. 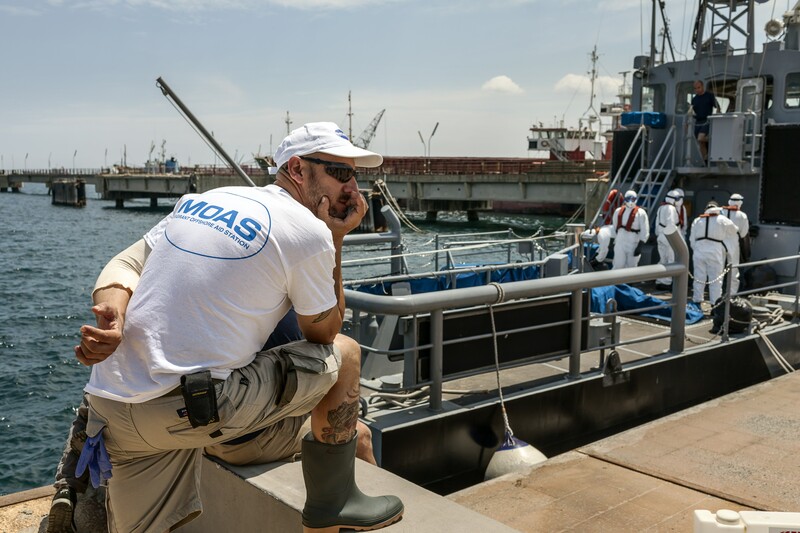 Antoine Camilleri, member of the rescue and search team of the MOAS looks at migrants coming from different countries as they disembark in the port of Augusta in Sicily a vessel of the Maltese Coast Guard which is anchor near the MOAS in the same harbor, and handed over to the Italian authorities after they have been rescued in the Mediterranean Sea. The harbor of Augusta is seen from the MOAS as the vessel is sailing from the port for another mission. 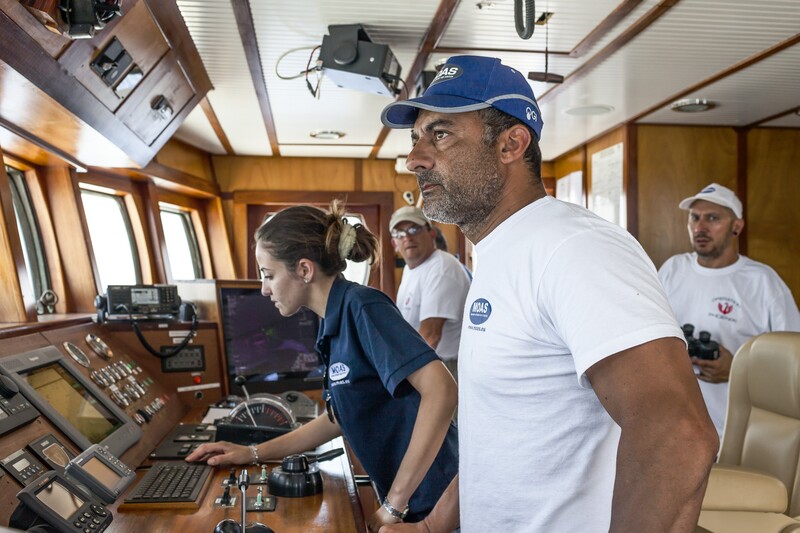 From left : MOAS First Officer Pauline Bonnici and Captain Gonzalo Calderon look at the navigation chart during their mission in the Mediterranean Sea. Schiebel Camcopter S-100 is seen on the deck ready to fly over the Mediterranean Sea during their search and rescue mission. 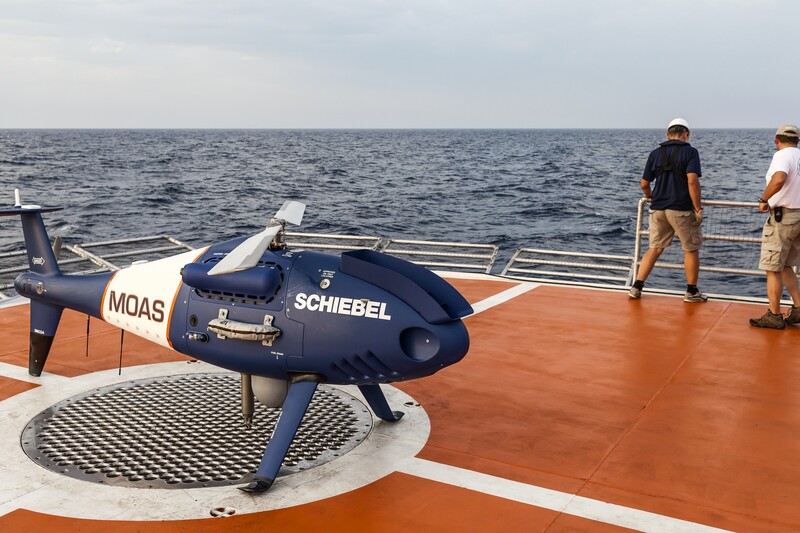 Schiebel Camcopter S-100 is seen taking off from the deck of the MOAS to fly over the Mediterranean Sea during their search and rescue mission. From left: MOAS First Officer Pauline Bonnici, and Rescue and Search Team members Ian Ruggier, Mimmo Vella and Antoine Camilleri are seen on the deck of the vessel in the exact moment that the Schiebel Camcopter S-100has identified a migrant boat in need of assistance and as they coordinate with the Directorate of the Italian Coast Guard in Rome to start the search and rescues mission of a boat with onboard about 77 migrants during their mission in the Mediterranean Sea. 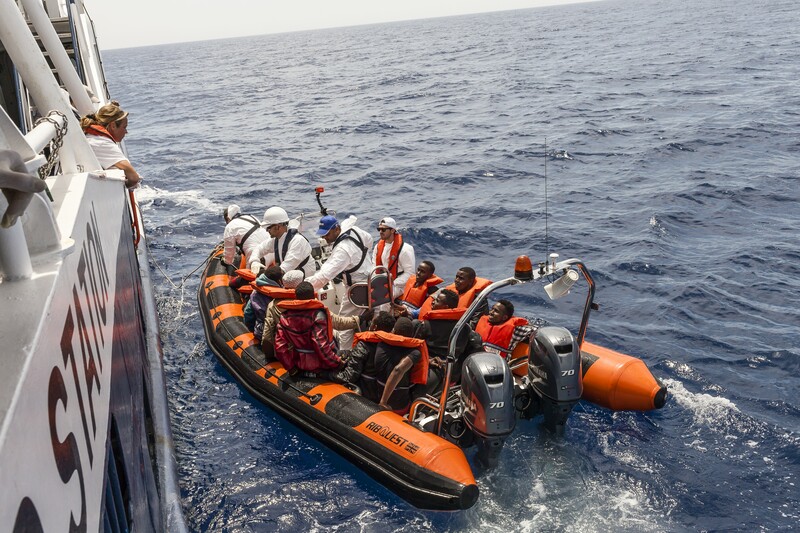 The MOAS Phoenix vessel is seen from the RHIB (rigid-hulled inflatable boats) during a search and rescue mission of a boat with onboard 77 migrants during their mission in the Mediterranean Sea. A makeshift RHIB with onboard 77 migrants whom left the Libyan coast overnight and whom have been sailing for seven hours is seen as it’s approached by the MOAS RHIB rescues and search team to rescue onboard of the MOAS the migrant during their mission in the Mediterranean Sea. 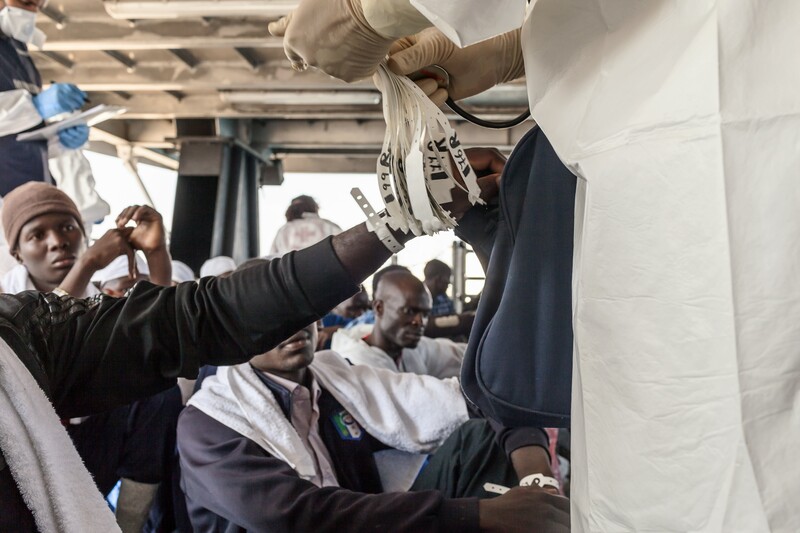 MOAS Rescues and Search team member, John Hamilton launches life savings jackets to 77 migrants onboard of a makeshift RHIB whom left the Libyan coast overnight and whom have been sailing for seven hours during the mission to rescue onboard of the MOAS the migrant in the Mediterranean Sea. From left: MOAS Rescues and Search team members, John Hamilton and Antoine Camilleri take onboard of the MOAS RHIB a woman part of 77 migrants rescued onboard of a makeshift RHIB whom left the Libyan coast overnight and whom have been sailing for seven hours during their mission to rescue the migrant in the Mediterranean Sea. 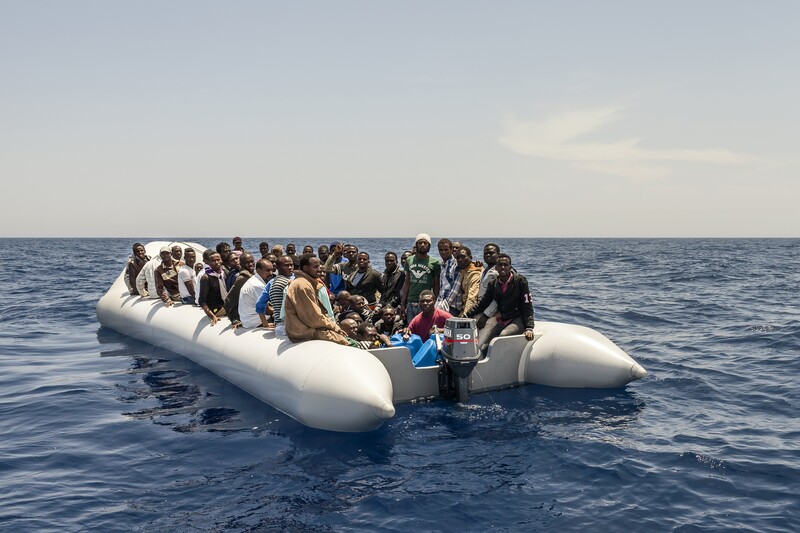 A portion of the seventh-seven migrants whom left the Libyan coast overnight and whom have been sailing for seven hours are seen on a makeshift RHIB, in the foreground of the Phoenix, as it’s approached by the MOAS RHIB rescues and search team after they have already received life savings jackets to rescue onboard of the MOAS the migrant during their mission in the Mediterranean Sea. 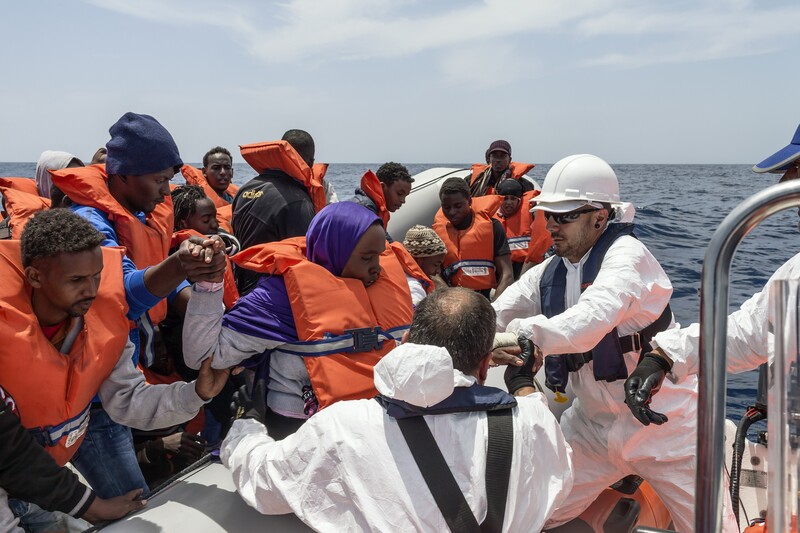 MSF (Medecins Sans Frontieres) members and MOAS Search and Rescue Teams members are seen onboard of the RHIB as they transfer onboard of the Phoenix part of the 77 migrants whom have been sailing for seven hours on a makeshift RHIB on June 10, 2015 during their mission in the Mediterranean Sea. MSF (Medecins Sans Frontieres), Simon Bryant (MD) on the left and MOAS co-founder Regina Catrambone are seen as they assist one of the 77 migrants whom left the Libyan coast overnight and whom have been sailing for seven hours on a makeshift RHIB as they are rescued and brought onboard of the MOAS by the Search and Rescue Teams members during their mission in the Mediterranean Sea. 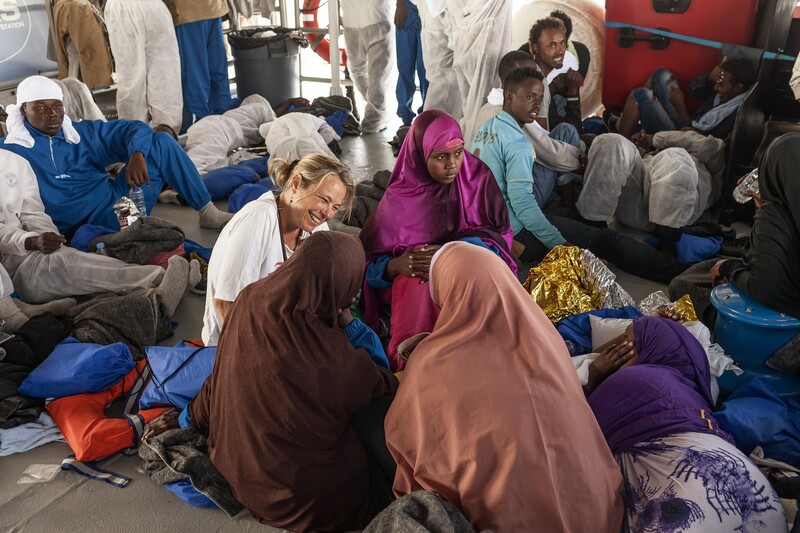 MSF (Medecins Sans Frontieres), Erna Rijnierse (Medical Team Leader) is seen as she assist onboard of the Phoenix some of the 77 migrants whom have been sailing overnight for seven hours before been rescued by the MOAS Search and Rescue teams during their mission in the Mediterranean Sea. From left: MOAS co-founder Regina Catrambone and MSF (Medecins Sans Frontieres), Erna Rijnierse (Medical Team Leader) are seen as they assist onboard of the Phoenix some of the 77 migrants whom have been sailing overnight for seven hours before been rescued by the MOAS Search and Rescue teams during their mission in the Mediterranean Sea. 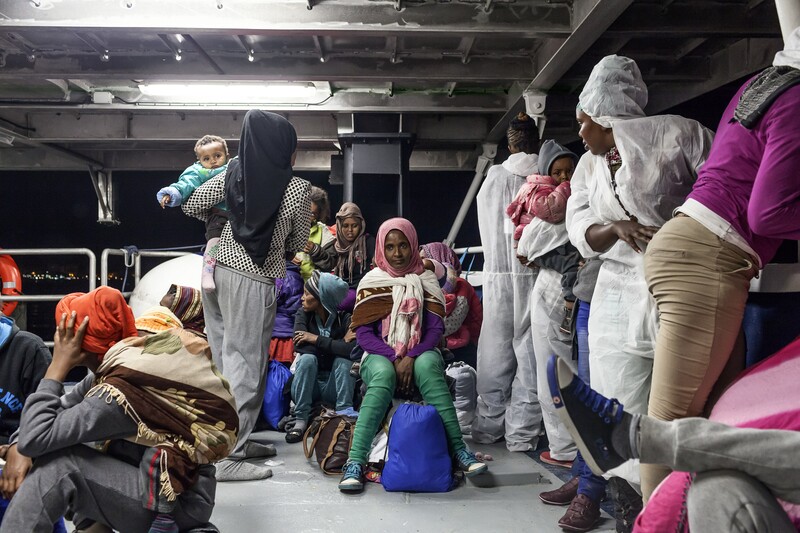 Some of the 77 migrants whom have been sailing overnight for seven hours before been rescued by the MOAS Search and Rescue teams are seen onboard of the Phoenix during their mission in the Mediterranean Sea. From left: MSF (Medecins Sans Frontieres) Will Turner (Emergency Coordinator) and Mary Jo Frawley (nurse) are seen as they deliver food onboard of the Phoenix to some of the 77 migrants whom have been sailing overnight for seven hours before been rescued by the MOAS Search and Rescue teams during their mission in the Mediterranean Sea. 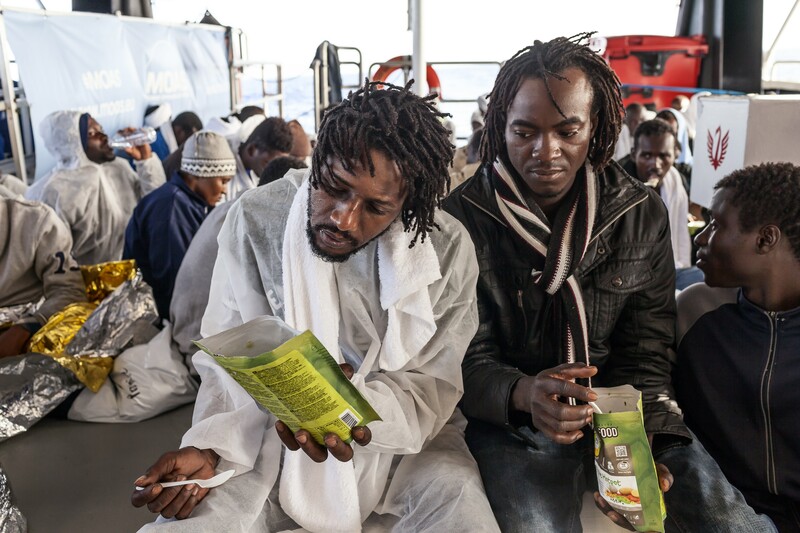 Some of the 77 migrants whom have been sailing overnight for seven hours before been rescued by the MOAS Search and Rescue teams are seen eating ready-made food onboard of the Phoenix during their mission in the Mediterranean Sea. 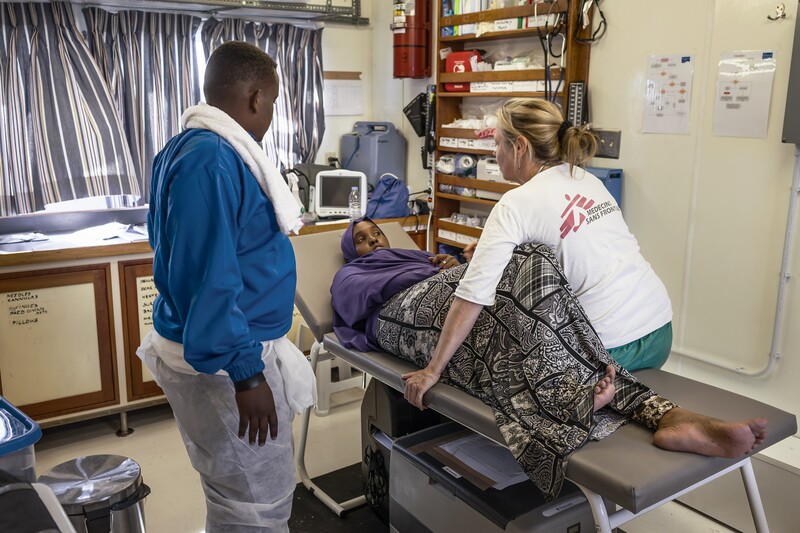 MSF (Medecins Sans Frontieres), Erna Rijnierse (Medical Team Leader) is seen as she assist onboard of the Phoenix a woman part of the 77 migrants whom have been sailing overnight for seven hours before been rescued by the MOAS Search and Rescue teams during their mission in the Mediterranean Sea. MSF (Medecins Sans Frontieres), Erna Rijnierse (Medical Team Leader) is seen as she assist onboard of the Phoenix a man part of the 77 migrants whom have been sailing overnight for seven hours before been rescued by the MOAS Search and Rescue teams during their mission in the Mediterranean Sea. 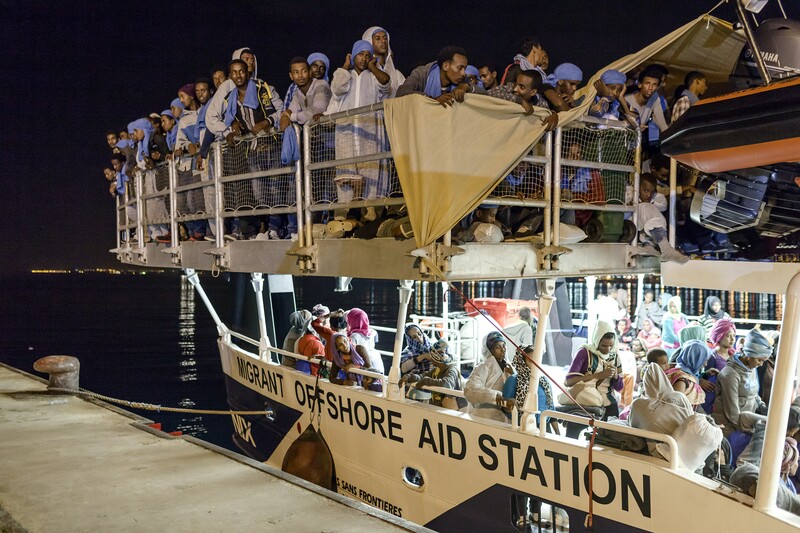 Part of the 77 migrants whom have been sailing overnight for seven hours before been rescued by the MOAS Search and Rescue teams are seen prior their disembark in the Sicilian harbor of Pozzallo, onboard of the Phoenix as they receive their first check and a tag identification number by the doctors of the Italian Health Ministry during their mission in the Mediterranean Sea. 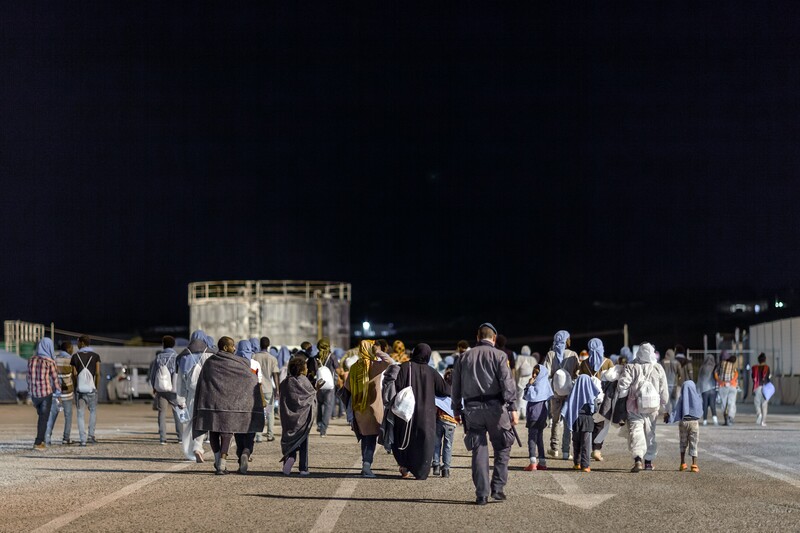 Part of the 77 migrants whom have been sailing overnight for seven hours before been rescued by the MOAS Search and Rescue teams are seen prior their disembark in the Sicilian harbor of Pozzallo, onboard of the Phoenix as they receive their first check and an identification tag by the doctors of the Italian Health Ministry during their mission in the Mediterranean Sea. 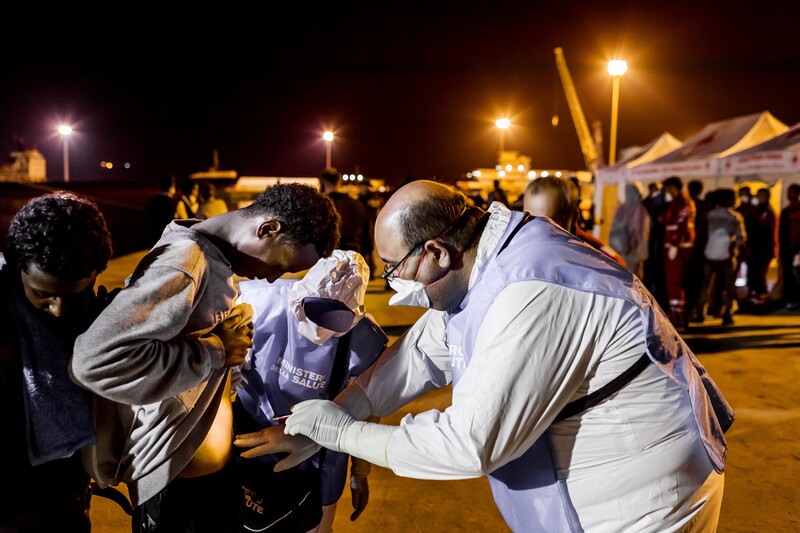 Some of the 77 migrants whom have been sailing overnight for seven hours before been rescued by the MOAS Search and Rescue team get identified on the quay by the Italian Police by a tag number given to them by the doctors of the Italian Health Ministry as they disembark from the Phoenix Vessel in the Sicilian harbor of Pozzallo during their mission in the Mediterranean Sea. Migrants coming from different countries are seen on the quay after they disembark in the port of Augusta in Sicily a vessel of the Maltese Coast Guard, which is anchor near the MOAS in the same harbor, and handed over to the Italian authorities after they have been rescued in the Mediterranean Sea. 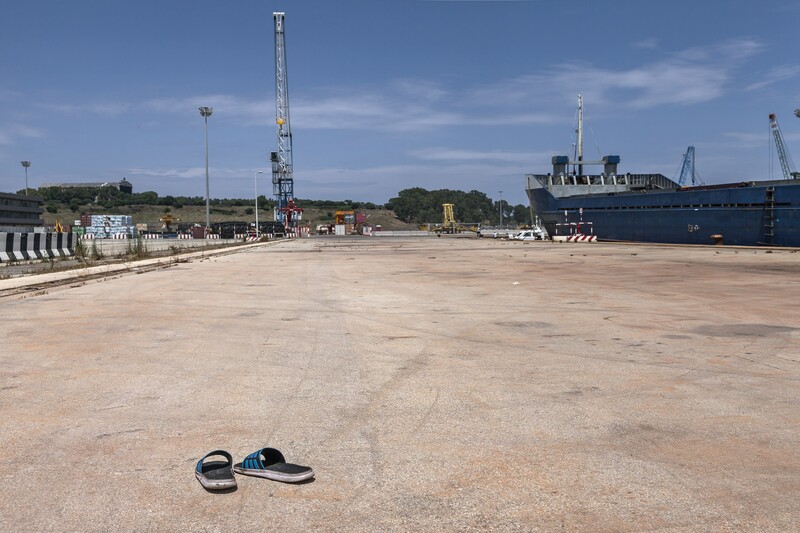 A pair of slippers are seen left on the quay by migrants coming from different countries after they disembark in the port of Augusta in Sicily a vessel of the Maltese Coast Guard, which is anchor near the MOAS in the same harbor, and handed over to the Italian authorities after they have been rescued in the Mediterranean Sea.